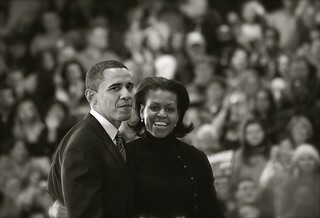 Barack and Michelle Obama exciting the stage after a campaign stop in Des Moines, IA. Less than 24 hours after this photo was taken Mr. Obama won the Iowa Caucus. Reflecting on this night three years after, it really does capture Obama at the last moment of the "underdog" phase of his campaign. The following day he would rise to national prominence and, with the help the national media who were in the gymnasium with him the previous night, would be catapulted to near a "front-runner" status.